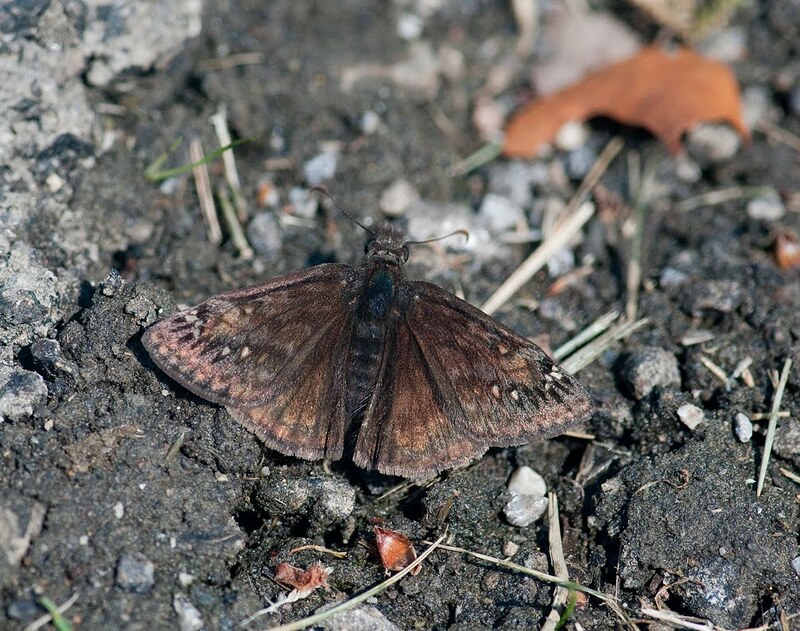 There were hundreds of Juvenal's Duskywing Skippers (a type of butterfly with hooked antennae) "puddling" on the roadside and along the hiking trails. 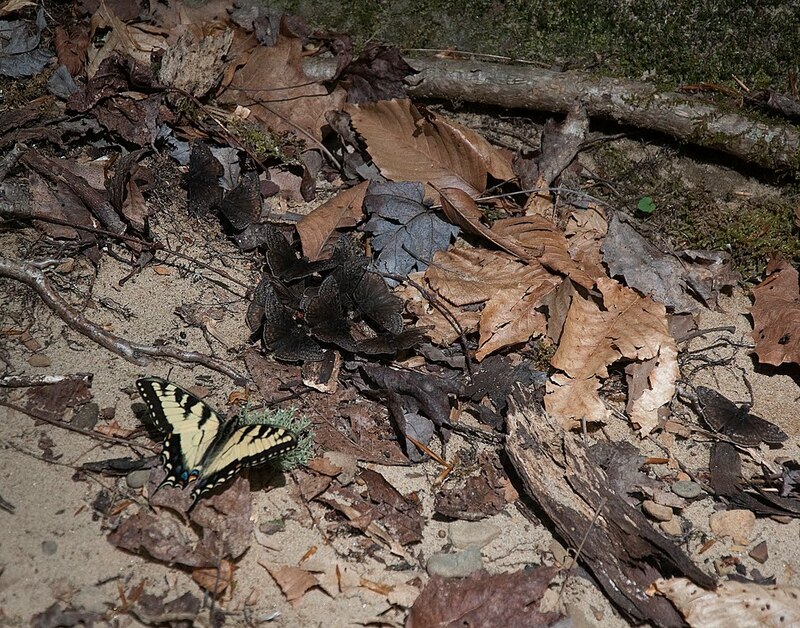 Often male butterflies will land on manure or where animals (or people!) have urinated to take up salts. When they mate with a female, they pass the salts on to her. 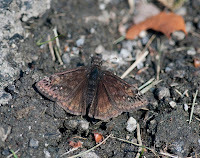 As I was photographing several skippers on a pile of dog droppings, I noticed 2 strange-looking insects. They looked like a cross between an earwig and a firefly with a yellow "tail." I didn't know what they were, but I figured I could figure out their identity from one of my many books when I got home. 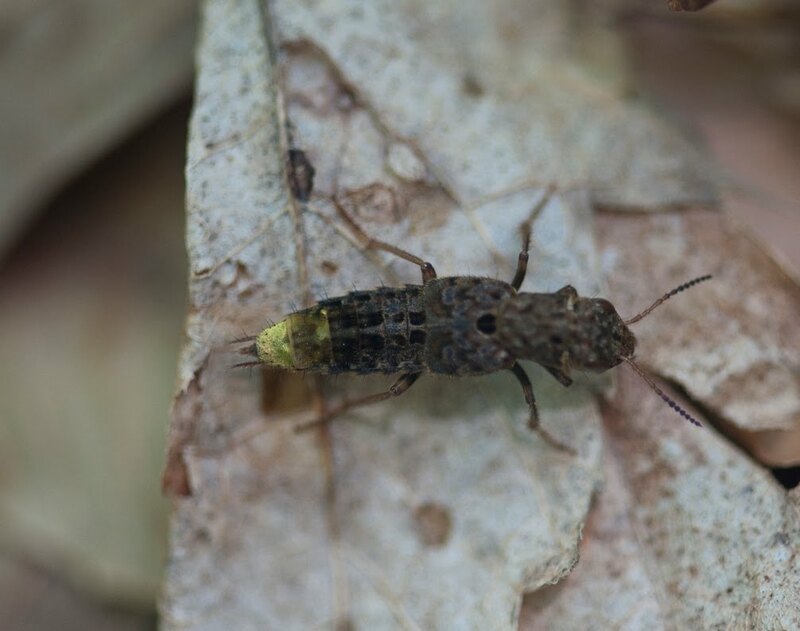 It turns out they are a dung-loving Spotted Rove Beetle (Platydracus maculosus). 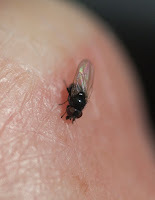 There were a lot of tiny black flies (right) that didn't bite, but they were quite irritating when they landed on any exposed flesh! 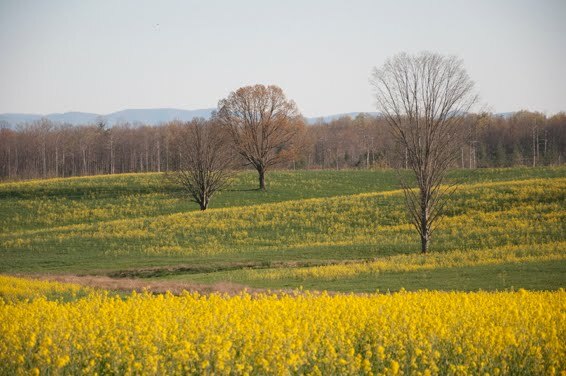 As much as I love Frozen Head, I don't like the flies, gnats and Yellow Jacket wasps that bug (pun intended) the heck out of people in the warm months. 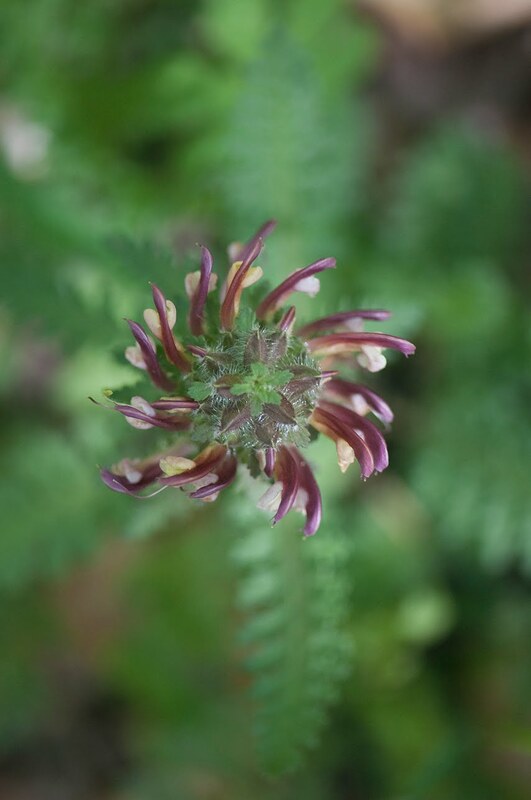 One of my goals of the hike was to find some Bishop's Cap plants in bloom. It look some hard looking, but I finally found a few. 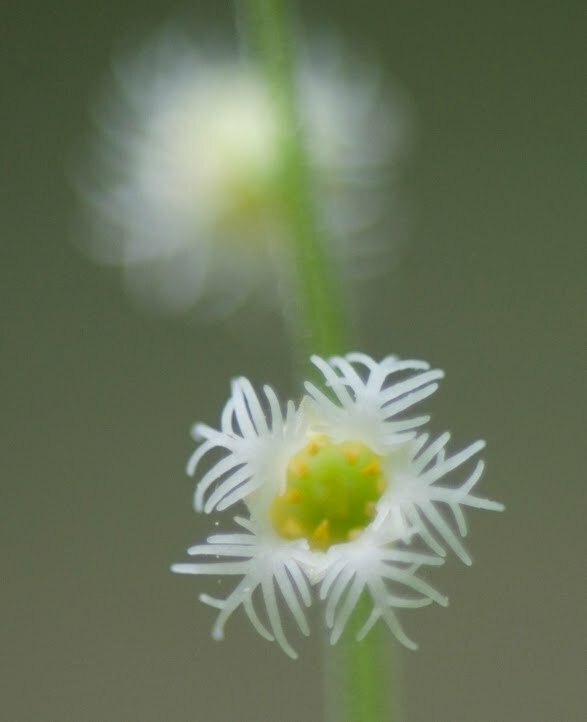 I have been wanting to get a really good close-up of an individual flower. They look like tiny 5-pointed snowflakes on a stalk. I had to get into some pretty awkward positions on the grou nd to get this shot, but it was worth some discomfort to get it! 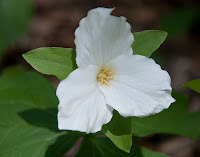 Frozen Head is famous for its beautiful Great White Trillium, I was happy to find a few of them in bloom too. I sure hope the weather cooperates tomorrow! It has been quite windy here today, that usually means a big change in weather. Considering it has been very warm and dry here lately, that must mean rain and cooler temperatures. I wish it would pour rain all night and get it over with before 10 AM tomorrow! I'm running a few days behind on this entry, there has just been too much going on this week! Sometimes I wish April had 60 days instead of 30! 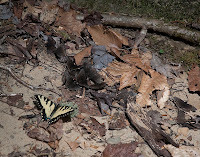 We went to Big South Fork National River and Recreation Area on Apr. 11 planning to hike up to the Angel Falls Overlook. It was quite a surprise when we went to cross the footbridge and saw it was blocked off. A large section of the middle was gone and the iron railroad rail support beam was badly bent. I guess there must have been a big tree that came down the river during the spring floods. I had long wanted to hike on the other side (the shorter, flatter, easier side! ), so we finall y had a good excuse to do it. Since that side of the gorge faces north, we saw lots of wildflowers. 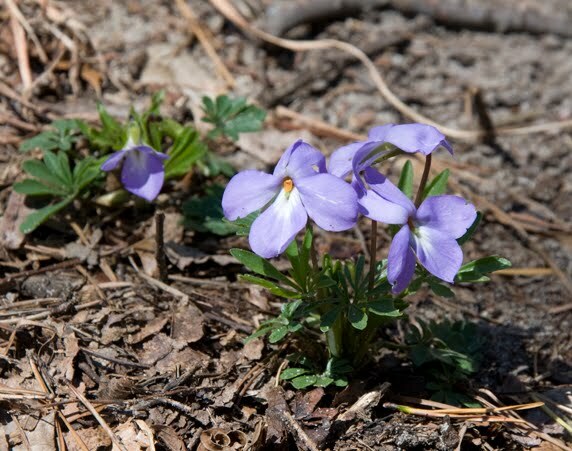 I was thrilled when one of the first flowers I spotted was a large patch of Virginia Bluebells (right)!These pretty flowers start out as pink buds, then tu rn a sky blue. I have not seen these in the wild very often, so this was quite a treat! 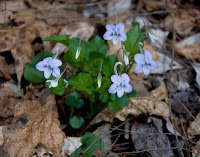 :) There were loads of violets of many colors --- pale lavender Long-spur (left), dark purple Blue, yellow Halberd-leaf, and dainty little Sweet Whites. 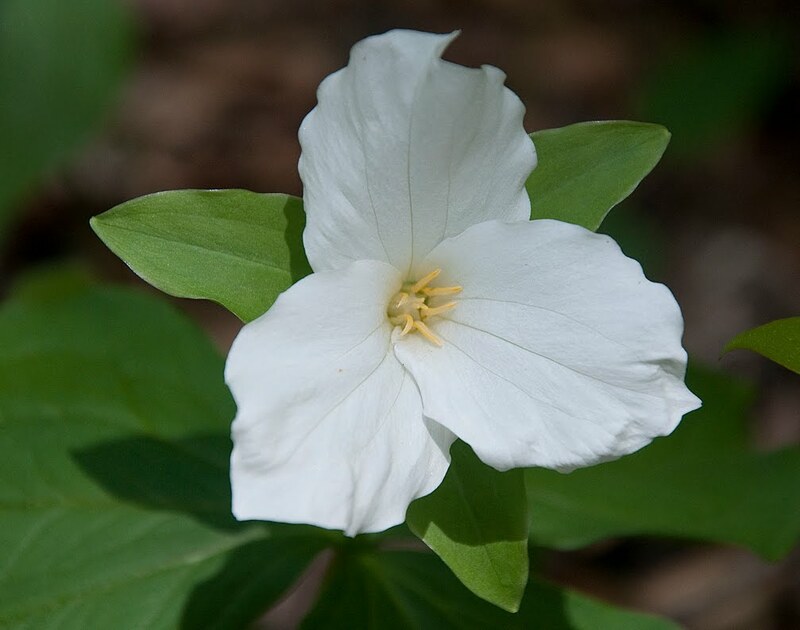 There were 3 kinds of trillium --- Lemon, large Toadshade and Southern Red. 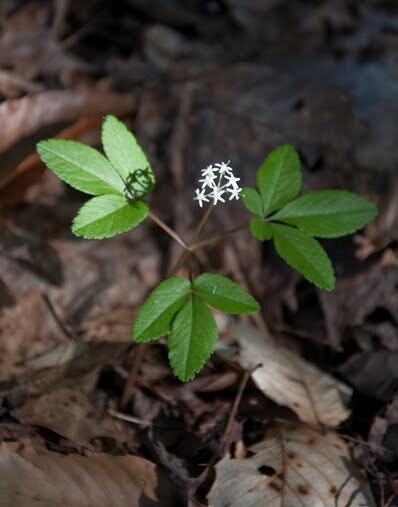 One very easy-to-overlook little wildflower that bloomed along the trail was Dwarf Ginseng. The flowers look like a cluster of tiny white stars. I've seen this flower at Frozen Head State Park in mid-April in the past. Angel Falls is actually a Class III or IV rapid between boulde rs in the Big South Fork of the Cumberland River. 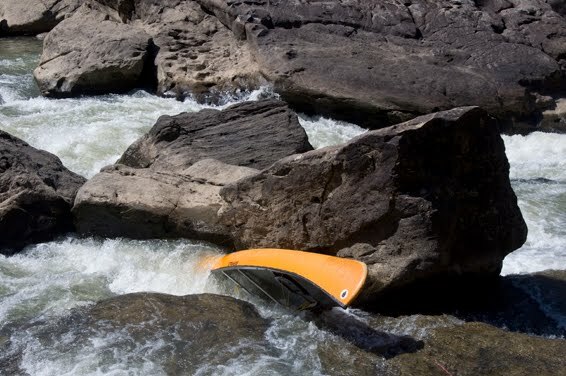 In high water times it can be quite a challenge to navigate a canoe or kayak. 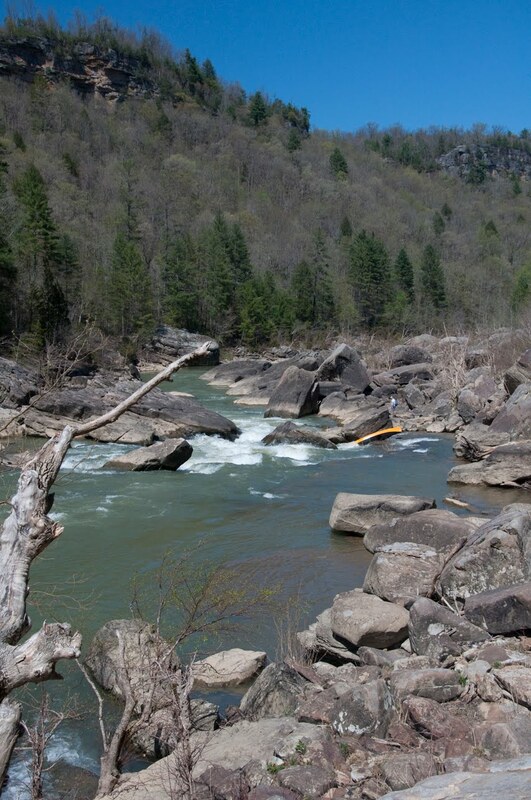 We saw a canoe that had become caught on a rock in the fast-moving water. The outfitter company will have to wait until the water level drops to retrieve it. That would sure mess up a nice river trip! As we were leaving the park we passed a large field full of Winter Cress, a highly invasive, but pretty yellow member of the Mustard family. Fortunately, there was nobody coming behind us, so Kenny stopped on the road long enough for me to snap a few photos. Amazing Ants and a bad case of MOADD! I don't know if there is such a thing as "Maturity Onset Attention Deficit Disorder" or MOADD, but I think I have it! I find it doesn't take much to get me distracted and WAY off task these days! This morning after I poured my cereal into the bowl and cut up the banana to put on it I noticed some items I needed to take to the recycle bin since today was pickup day. 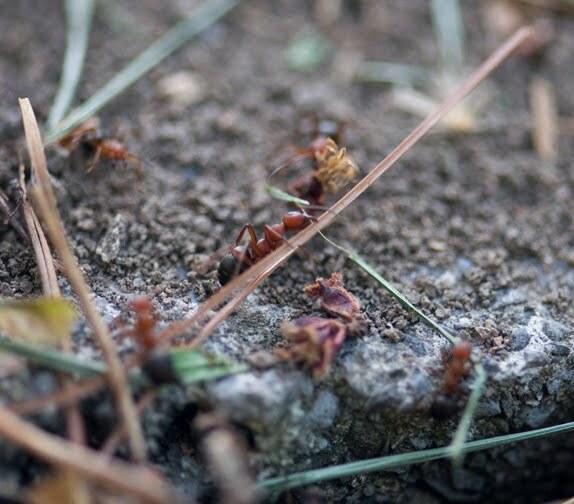 As I was going up to the bin by the curb, I noticed ants were clearing a large amount of soil between the expansion joint in the driveway to use as a trail. So, I went to get my camera to get some photos of them at work. 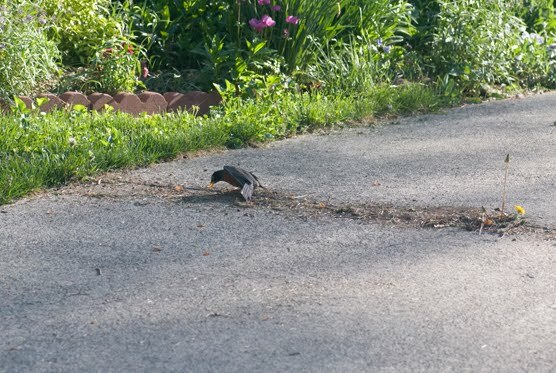 When I got back out there a few seconds later, I noticed a robin standing on the driveway next to the ant trail. I realized I was witnessing a bird activity called anting. He would peck at the ants and spread his wings above them to get them riled up. Some ants spray formic acid from their abdomen as a defense mechanism, birds have learned to take advantage of this practice by using the ants to help rid them of mites and bird lice on their feathers. How cool is that!? Unfortunately, I had my macro lens on the camera and I couldn't get much closer, so this video isn't as good as I would have liked. If I had run inside again to change to the telephoto lens, I would have missed it! 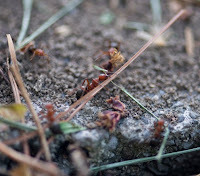 I was most amazed though when I watched a one poor ant struggling to drag a stone out of the path. 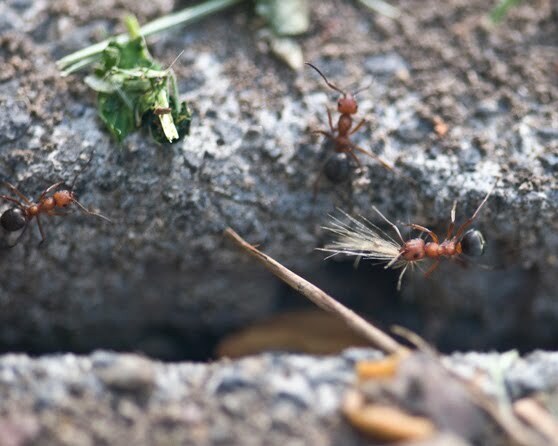 The incredible strength of ants is mind-boggling! Can you imagine trying to pull a boulder bigger than yourself out of the road just using your teeth!? The "busy season" has now arrived! 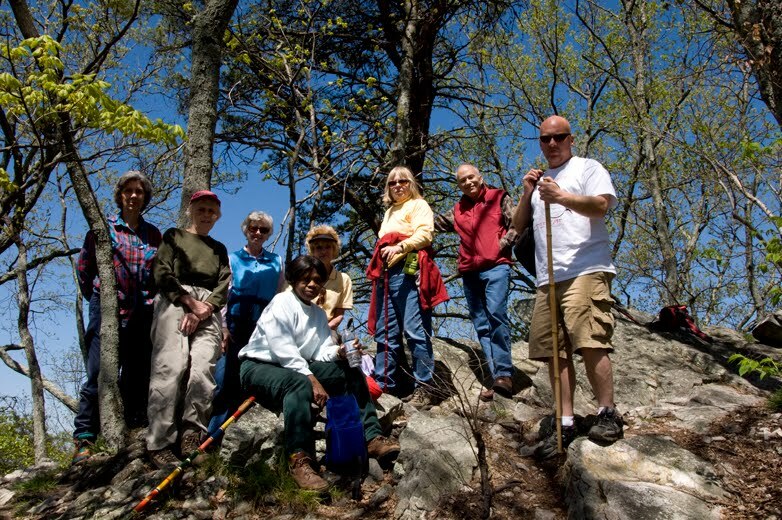 On Saturday I led a hike for the Tennessee State Natural Areas Week up House Mountain in east Knox county. The hike is a 4-mile loop with a 1000' elevation gain. I had 11 participants, mostly ladies in their 60's and 70's. I was very impressed, that is not an easy hike and they did great! I hope I will be as agile and active in 20 years! :) You go, girls! Here is the group after we refueled at lunchtime. 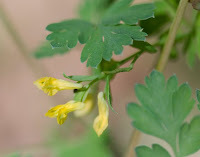 We saw 23 different species of wildflowers, including one I hadn't seen i n over 20 years, called Yellow Corydalis. 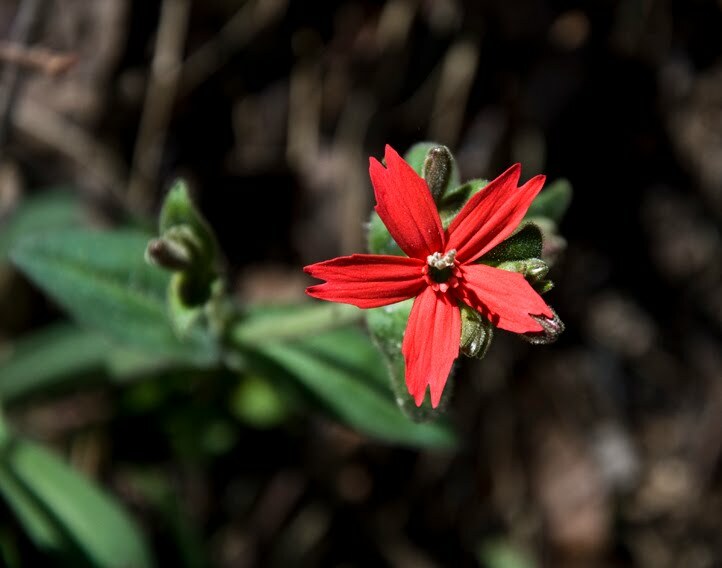 Another pretty flower was Fire Pink (right), which is actually red. Other wildflowers included: Perfoliate Bellwort, Plantainleaf Pussytoes, Wood Vetch, Birdsfoot Violet, Smooth Rock Cress, Wild Geranium, Lemon Trillium, Blue Phlox, Bluets and many more. As we were trudging up the mountain I heard something rust ling in the leaves next to the trail. I signaled for everyone to stop so I could see what it was. 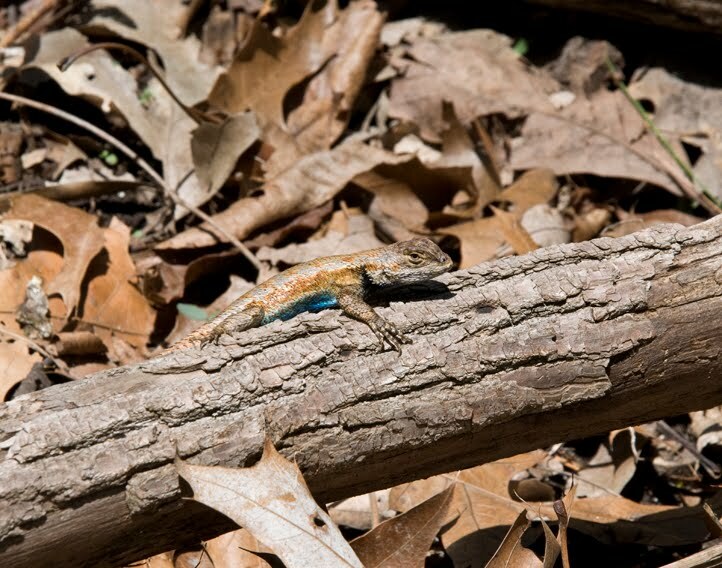 Suddenly, an 8" lizard scurried up on a fallen branch to warm itself in the sun. When I got closer, I could see it had blue belly scales. My reptile ID book listed it as a male Eastern Fence Lizard. What a handsome guy he was! Later in the afternoon when we were hiking back down, I heard someone behind me say, "There's a snake!" It turned out to be a large Black Rat Snake that was in a hollow log. It was a great day for reptiles! Another "hike-stopping" moment was when I spotted 2 Birdsfoot Violet plants blooming along the trail at the top of the mountain. The flowers are quite large in comparison to the rest of the plant. It is always a thrill to see them! Even though the trail is on the south side of the mountain, we still saw a lot of different wildflowers. The north side is on private property and not open for hiking. Sadly, the trails have suffered some serious erosion probl ems because some hikers have not followed the trails. 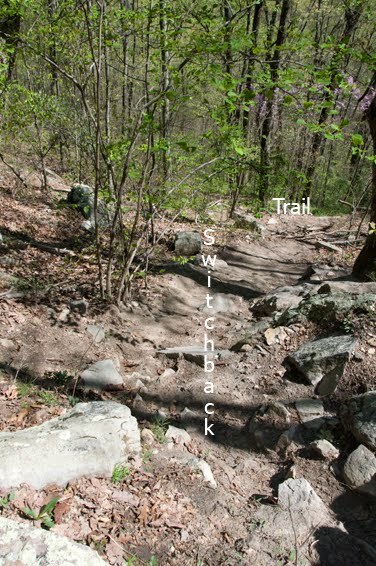 By cutting switchbacks, they have damaged some of the trails beyond repair. This photo (right) shows the damage that can be caused by making new trails down a steeper part of the slope. I took the photo from the trail above, the lower part of the trail can be seen in the upper middle part. The switchback goes down the center of the photo. If people would follow trail etiquette, this type of damage would not occur. 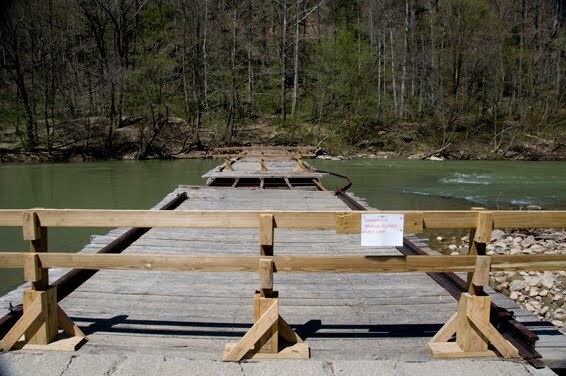 It will cost the state (ultimately, the taxpayers) a lot of money to repair the damage.